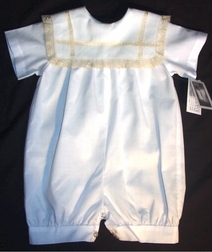 Beautiful heirloom boy's bubble or button on made of batiste cotton embellished with lace vertically and horizontally through and trimming the square collar. Perfect for ring bearers, portraits, holidays and any other special occasion. By Peppermint Pony for Caroline Bradlee.